Near this spot stood the first court house of Berkshire County erected 1764. Location. 42° 11.627′ N, 73° 21.792′ W. Marker is in Great Barrington, Massachusetts, in Berkshire County. Marker is at the intersection of Main Street (U.S. 7) and Castle Street, on the left when traveling north on Main Street. Touch for map. 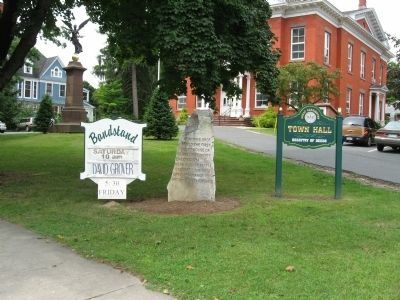 Located in front of Great Barrington Town Hall. Marker is at or near this postal address: 334 Main Street, Great Barrington MA 01230, United States of America. Touch for directions. Regarding First Court House of Berkshire County. 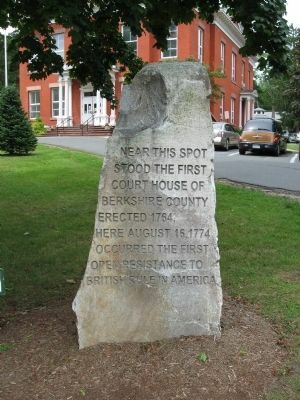 On August 16, 1774, the townspeople of Great Barrington assembled at the courthouse on court day. They locked the doors and refused admittance to Judge Ingersoll, a crown judge. Tradition says they dragged his cocked hat and powdered wig through the mud; placed him backwards on an old horse and rode him out of town amid jeers. The next day the judge and his sympathizers attempted to regain entrance to the courthouse. He was arrested and jailed in Litchfield County, Connecticut. Leaving jail he returned to his home in Hartford, and then to England. No more courts answerable to the king were held in Great Barrington. Soon many courthouses in New England closed their doors to English demands, leading to the beginning of the Revolutionary War in April, 1775. More. Search the internet for First Court House of Berkshire County. Credits. This page was last revised on June 16, 2016. This page originally submitted on August 30, 2012, by Michael Herrick of Southbury, Connecticut. This page has been viewed 515 times since then and 6 times this year. Photos: 1, 2. submitted on August 30, 2012, by Michael Herrick of Southbury, Connecticut.